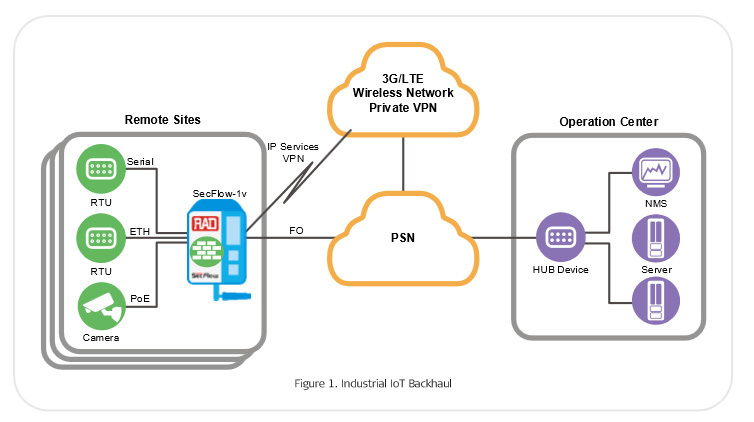 SecFlow®-1v is an industrial IoT gateway, a member of RAD’s SecFlow suite of ruggedized Ethernet products. The RAD SecFlow-1v is an open platform hosting third-party software, besides its communication capabilities. The SecFlow-1v from RAD features four GbE Copper ports and one GbE SFP port, two serial RS-232 ports or one RS-232 plus one RS-485, PoE, and a cellular modem with two SIM cards for maximum link resiliency. SecFlow-1v supports third-party applications using Linux containers for quick introduction of new capabilities for Industrial IoT solutions. SecFlow-1v from RAD is equipped with serial interfaces for connectivity of legacy RTUs with new IP-based IEDs. SecFlow-1v gateway converts legacy IEC-101 protocol to IP-based IEC-104, enabling seamless communication from the IP SCADA to both the old and new RTUs. This provides a single box solution for multi-service applications and smooth migration to all-IP networks. The SecFlow-1v gateway is designed for installation under harsh environmental conditions. It features DIN-rail mount, IP30 protection level, wide operating temperature range (-40°C to 75°C) without fans, and EMI immunity (IEC61850-3, IEEE1613). SecFlow-1v operates with SecurityGateway, SecFlow-1, and SecFlow-2. Remote user access, using SSH Inter-site VPN based on IPSec encrypted link ensures L3 transparent connection of the Ethernet networks sites. For remote access, the router uses an SSH-encrypted tunnel, with user authentication and specific access authorization. The device can be managed via the SecFlow web-based interface (HTTP/HTTPS). SecFlow-1v also supports a variety of access protocols, including CLI, Telnet, and TFTP/SFTP.